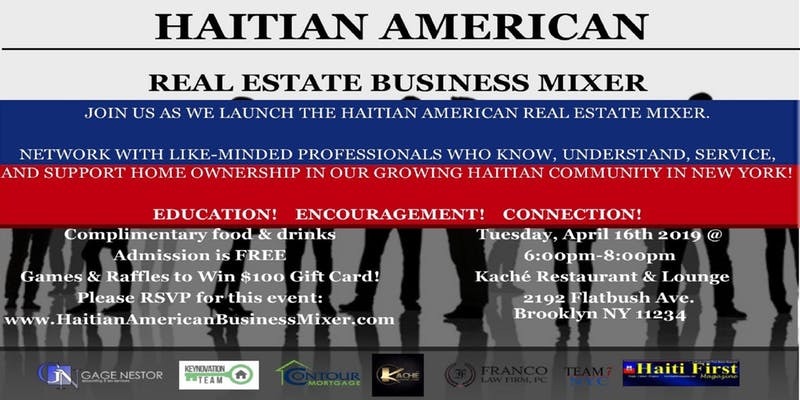 JOIN US as we launch the Haitian American Real Estate Mixer. Network with some of the best in the industry. You will meet Haitian American Professionals who know, understand, service, and support home ownership in our growing Haitian American Community here in New York. Get ready to meet, Brokers/Agents, Investors, Attorneys, Loan Officers, Title Professionals and more. We will also have 3 guest speakers! The purpose of initiating this gathering is to build a community of licensed professionals who are involved in the home buying/selling process, at the same time who are of Haitian descent. From our experience over the years, we had a difficult time locating or accessing such professionals at the time of need. This mixer is to bring awareness and fill in that void by gathering and eventually creating an association depicting such group. We want become a community that reflects entrepreneurial spirit, cultural heritage and the advocacy for their members. Our mission is to promote sustainable home ownership opportunities in our communities.